Copper Mountain Technologies' top-of-the-line COBALT C2220 analyzer boasts a frequency range of 100 kHz – 20 GHz, offers a typical dynamic range of 145 dB, and is designed for operation with any Windows PC or laptop. It efficiently handles advanced test applications, providing an unmatched price-performance combination for S-parameter measurement for this frequency range. 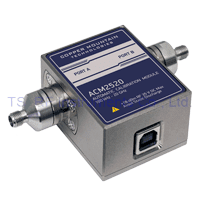 Compared withe the Cobalt C1220, COBALT C2220 provides direct receiver access for special applications involving external directional coupling, including Load Pull and high power measurements. To achieve this high performance at an affordable cost, the design and production of COBALT C2220 VNAs incorporates several innovative new proprietary manufacturing and test approaches. This technology allowed for new test grade coaxial connectors technology for internal interconnect and tighter tolerances that contribute to Cobalt’s exceptional metrological accuracy. Advanced electromagnetic modeling optimizes the 20 GHz Cobalt’s ultra-wideband directional coupler design, and new production methods for precision airstrip lines give the directional couplers extraordinary stability, both over temperature and very long time intervals. COBALT C2220 VNAs also feature hybrid dual-core DSP+FPGA signal processing engines, and new frequency synthesizer technologies. These advances propel Cobalt’s measurement speed to among the most advanced instruments in the industry, and well past the achievements of any cost-competitive products.